Blockchain technology is expected to have a tremendous impact on the transportation industry. To understand its basics and potential, begin with Timothy Leonard’s expansive white paper, “Blockchain for Transportation: Where the Future Starts,” then check out our blog post Blockchain Technology: The 21st Century Link For Profit and Growth and pre-recorded webinar. 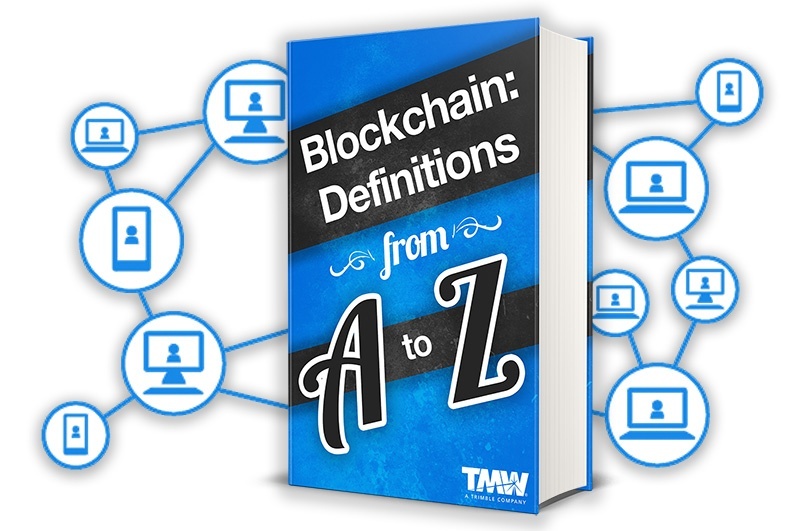 For further help in learning the language of blockchain, we’ve compiled an A-to-Z glossary from multiple sources defining the most common terms related to Blockchain. Blockchain addresses are used to send or receive transactions on the network. An address usually presents itself as a string of alphanumeric characters. Bitcoin is the first decentralized, open source cryptocurrency that runs on a global peer-to-peer network, without the need for middlemen and a centralized issuer. Block explorer is an online tool to view all transactions, past and current, on the blockchain. A form of incentive for the participant (called a miner) who successfully calculated the hash in a block during mining. Verification of transactions on the blockchain generates new coins or tokens in the process, and the miner is rewarded a portion of those. Also known as tokens, cryptocurrencies are representations of digital assets. While Bitcoin is one of the most widely recognizable names, there are more than 900 cryptocurrencies in use. Mathematics creates codes and ciphers to conceal information. Used as the basis for the mathematical problems used to verify and secure transactions on the blockchain. A decentralized application (Dapp) that is open source, operates autonomously, has its data stored on a blockchain, incentivized in the form of cryptographic tokens and operates on a protocol that shows proof of value. Distributed ledgers are databases storing data across a network of decentralized nodes. A distributed ledger does not have to have its own currency and may be permissioned and private. A blockchain-based decentralized platform for apps that run smart contracts, and is aimed at solving issues associated with censorship, fraud and third-party interference. The act of validating blockchain transactions. The necessity of validation warrants an incentive for the miners, usually in the form of coins or tokens. Multi-Signature--also known as multisig-- addresses provide an added layer of security by requiring more than one key to authorize a transaction. A private key is a string of data that allows you to access the tokens in a specific wallet. Private keys, also known as secret keys, act as passwords that are kept hidden from anyone but the owner of the address. A consensus distribution algorithm that requires an active role in mining data blocks, often consuming resources, such as electricity. The more ‘work’ you do or the more computational power you provide, the more coins are rewarded. A file that houses private keys. It usually contains a software client which allows access to view and create transactions on a specific blockchain that the wallet is designed for. There are two main types of wallets: software and hardware. A software wallet is one that you install on your own computer or mobile device. A hardware wallet stores private keys on a secure hardware device.